Learning Music Theory is something I’m super passionate about. Having this understanding ingrained in my subconscious I credit as one of the major reasons I’ve managed to pay my mortgage as a professional bass player, here in the UK for the past 15 years. However, we live in a world now where tablature to the greatest bass lines in world are only a few clicks away. So why even bother going to the effort of learning this stuff? 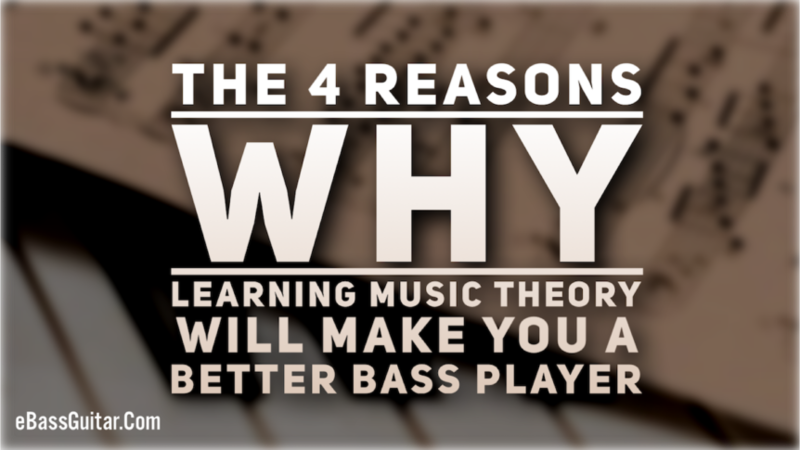 It’s a great question… because music theory is something that inhibits so many bass players. I’m here to tell you it’s not as difficult as you think. But first off I think it’s worth really understanding WHY this stuff matters. Once you do… it’ll make the learning curve totally worth while. 1 - It helps us identify musical sounds so we can identify them again at a later time. If we can identify music sounds it makes learning and recalling bass lines, runs , fills all the way through to a whole a song so much easier. The act of writing out a simple chord chart has allowed me to learn over 500 songs over the past 15 years. All of these songs sit on my iPad and I can access any of them at moments notice. No longer am I reliant on have to memorise every song I learn and hours of practise before a gig to recall them. All of these charts are available in The Bass Vault in the Bass Lab PLUS membership. 2 - It allows us to group musical sounds together so we can create relationships between certain sounds. If you just work from Tab the chances are you look at each note as ‘Island’ and you just repeat patterns on the neck ‘parrott passion’. The reality is when you play a chord sequence every note is related to each other in someway. Even the most weird chord sequences and bass lines will have relationships to each other. When you can identify that relationship it will open up all the other possibilities. Take the chord sequence C - Am - F - G. There are 100s of different ways you can play this one sequence, if you know where to find each of the notes on the neck. When you understand more music theory just imagine what it would be like to see the neck lighting up like a Christmas Tree with all the possibilities… That’s why you see bass players effortlessly navigating around neck. 3 - It allows us to give musical sounds names so we can communicate them to other musicians. When we get to the point of being able to accurately name the construction of chord sequences, bass lines and fills, it makes it vastly easier to communicate to other musicians fluently. I like to think of tab being a foreign language phrase book. It’s fIne if you’re in Paris and you want to order an ice cream under the Eiffel Tower. However, Music Theory gives us all the verbs, nouns, adjectives we need to hold a fluent and interactive conversation. A fluent command of music theory means you can communicate music ideas with total precision to your fellow band mates. It removes conversations which often consist of “it’s kinda a bit like this” to musical ideas presented with confidence and accuracy. The chances are it will also reduce the amount your band needs to rehearsal and alleviate frustration too. Once you know what’s ‘theoretically’ possible it helps you identify and predict chord sequences and bass lines ‘in the moment’. It will just give that ‘sixth sense’ of what’s coming next. Over the years there have been many, many songs I’ve learned on the fly, actually on the gig, with zero preparation. The reality is at least 80% of Top 40 pop and rock music relies on a few simple formulas. Once you’ve learned these you’ll see them time and time again. This is the ‘secret sauce’ that allows you to rock up to jam session and feel confident to pick up the bass and join in. This stuff isn’t crazy voodoo magic where you need the ears of a hawk. You need to learn the basics and more importantly, how music theory directly applies to the bass guitar. That’s just as important. That’s why I wrote The Complete Guide To Music Theory for Bass Players eBook. 50 pages of the music theory that matters for us bass guitarists... with all the fluff stripped right out. One last thought… this stuff isn’t hard. You just need to learn it in a step by step fashion with the context of the bass guitar as your instrument. Music Theory for years has been made far harder than it needs be. It’s either been written for every other instrument other than the bass guitar… to the writers have created books which are filled with irrelevant stuff to create the page count. I’ve taken the time to put that right… so you can feel the benefits learning this amazing knowledge. Here’s where you can grab your copy. Get the Music Theory eBook.